This map shows the origins of my brother’s Y-DNA, according to Family Tree DNA. I have no idea what the one red dot in Germany is about. I’m assuming it has to do with migrations of one sort or another. I’m more interested in the cluster of red dots in Ireland because everything else about our DNA search for family origins has pointed to Ireland. Y-DNA is the specific type of DNA that is passed down from father to son for many generations relatively unchanged. Only men can take the Y-DNA test, and it tells the history of their paternal line. 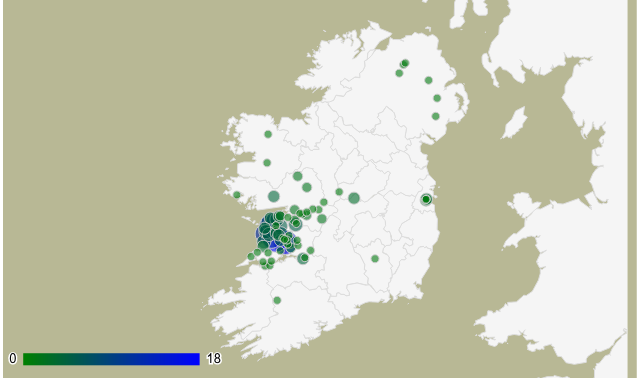 Our family history, based on my brother’s Y-DNA, appears to focus around County Clare and/or County Limerick, Ireland. That’s where the three red dots joined together on the map are located. The earliest known ancestor in my brother’s paternal line that we can trace back to is a man named James Gerald who lived in South Carolina in the 1700s. He is said to have been born in Ireland around 1709. We don’t know anything about his parents, what year he came to America, or why he came. We only know that he married a woman named Mildred Taliaferro and had a son named Gabriel Gerald. Family lore says that James Gerald was born a Fitzgerald, though, and changed his name when he came to America. That’s where things get interesting in the DNA analysis on my brother (seven generations removed from the original James Gerald). We aren’t coming up with any significant matches to Fitzgeralds in Ireland. We are, however, matching a number of people named O’Loughlin, McLaughlin, or variations thereof. We also match a few other random surnames, but most of those are so distant they could come from a time before surnames. I don’t know what this means exactly in terms of our family history, but it does open up the possibility that our James Gerald was never a Fitzgerald and that he may have changed his name from something else altogether. Interestingly enough, when I did a search for the origins of the name O’Loughlin, I ran across a map that shows O’Loughlins living in Ireland in the 1800s (from JohnGrenham.com). You can see from this map that there is a huge concentration of O’Loughlins in one particular area, and that area happens to be an almost exact match for my brother’s Y-DNA SNP matches map. The concentration of O’Loughlins shown here is mainly in County Clare, Ireland. There are also a lot of Fitzgeralds in this area. We haven’t completely ruled out Fitzgerald as a possibility. We’ve just increased the probability that our James Gerald came from a family of O’Loughlins rather than a family of Fitzgeralds. This is an ongoing process, though, and we may discover more information down the road that changes the scenario again. If that happens, I will probably write another blog post about it. Also, if you are a Gerald interested in using DNA to trace ancestry, please consider using Family Tree DNA to do a Y-DNA test on a male with the Gerald surname. The more Geralds we can get to take the test, and the more distant the connections are, the more we can be certain of the results. And if you happen to be a Gerald with a whole lot of money, maybe you could go to County Clare, Ireland, and convince a bunch of men with the surnames Fitzgerald and O’Loughlin to take DNA tests from Family Tree DNA so that we can find out exactly which family we match. Alas, it might take a while for me to come up with that kind of money. Meanwhile, I’ll keep documenting what I find out about the family history here so that I will remember it myself and be able to share it with others. Thank you, Sharon. This information is very interesting. Shawn has also searched his DNA, I don’t know if he went this route. His DNA connected to Norman Gerald, Daddy’s nephew, and some people I don’t know. Apparently few of the Geralds have had DNA tests done.